Saunas are used both therapeutically and recreationally by offering a low humidity and high heat environment that is perfect for relaxation. Made of close and soft grain woods on the inside, most saunas have a wooden bench for reclining or seating. When shopping for your sauna, you need to ensure that you get only the best model from the market. This is why we have reviewed the best outdoor sauna on the market today. Here are the top outdoor saunas that you will get on the market today. Looking for an outdoor sauna for your home? You might consider the Finlandia Outdoor Sauna With Roof Kit. 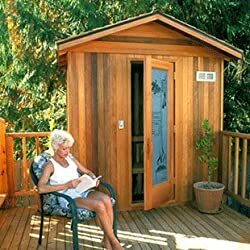 This sauna uses Western Red Cedar for both the interior and exterior and it is a great sauna for relaxing. The Red Cedar offers it durability and long life, meaning that you can always count on the sauna to provide you with the relaxing you desire for years to come. Spacing is not an issue with this model thanks to its reasonable size of 2×2 inches seating with superb 3/8 inches spacing. Therefore, you can rest in our outdoor sauna and still enjoy the comfort of a commercial sauna. However, it is designed to accommodate one grownup since this space isn’t the best in the industry. The model makes use of stone-based heating technology to provide a warm environment you want in your sauna. The stone-based system is ideal for people who love Finnish-style saunas. The sauna also has a Fir Clear Glass which is pre-hung and measures 24 inches long. One great thing about this sauna is the ease of installation since it is easy to attach to existing patios. It is also one of the lightest saunas on the market today – you don’t need to get professional help when installing it due to the two features. What’s more, it comes with a DVD that has a guide on how to install the sauna. This means you can save money when installing it since it’s is a DIY product. Besides, you can use this sauna on ground-level areas or even elevated ones. You will also be excited to learn that some of its parts, such as benches, come already assembled and ready for use. It also offers great insulation that is required in saunas. The model is also beautiful both inside and outside, making it an attractive sauna for home use. Searching for a spacious 4-person outdoor sauna? Look no further than the Decorate With Daria 4-Person Outdoor Sauna. This product is made of hemlock wood that provides it with durability and long lasting life. It also an impressive model that uses infrared heaters to make the room comfortable and in the right condition for relaxation. 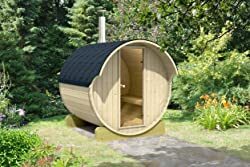 The sauna features shingles that add to its strong construction, making it a strong sauna that will hold 4 persons. You might be deceived when you here that it uses hemlock wood but shingles are the main material used here. In fact, the only places that you will find wood being used are all those areas that can only be made using wood. The best thing, the wood has been kiln dried to thwart health-related problems from arising. The company also took time when constructing the sauna to ensure that you get a safety that you deserve. You will be excited to learn that there is no glue used to join 2 parts, meaning that there is no chance of falling apart due to humidity. The sauna is able to heat up pretty fast and is quite comfortable for use. You don’t need to be bored while relaxing in your sauna and this is why there is a CD player and AM/FM radio. Thus, you enjoy your therapy while listening to your preferred music for a complete body and mind healing. One thing you should note about this sauna is that it isn’t insulated but it depends on double wood walls. This means that you will still get the warmth you want and have a great time while in your sauna. We all want to enjoy with our loved ones in our home sauna, but it can be tricky to get a model that will accommodate the whole family. However, thanks to Sunray Cayenne 4-Person Outdoor Sauna, you can easily have that fun-time with all your family members. This model is made of natural Canadian hemlock wood that provides it with many years of existence. To provide the desired heat and warmth, the sauna has 8 ceramic heaters that work together to warm the sauna and make your therapeutic session worthwhile. Unlike most saunas out there, this outdoor sauna comes with an LCD control panel that makes it easier to control its temperature and humidity. You also get to enjoy recessed exterior lighting that makes it beautiful when relaxing in your sauna. That’s not all since the sauna come with a CD player, MP3 and FM radio that allow you to listen to your favorite tracks while taking a rest. And you can take your drink in the sauna and place it in the cup holder. The sauna also has four movable ergonomic backrests that makes it more comfortable when relaxing in your sauna. Besides, it comes with an oxygen ionization system that helps to purify the air inside your sauna. One thing about this outdoor sauna is the ease of assembling. You don’t need to hire a professional to assemble it for you and its design will enhance your outdoor décor and setting. It is also a big sauna that measures 72 x 52 x 83 inches and boasts of naturally appealing and smooth design. And you get a 7 years structural warranty that guarantees defects in workmanship and materials. So, you can have the peace of mind while chilling in your sauna knowing that you are covered for 7 full years. The barrel is the best shape for any outdoor sauna for many reasons. These types of saunas have 23% less space that needs to be heated, unlike other saunas with corners but of the same size. Also, cylinder shape provides natural continuous air flow because the air moves back and forth on the walls. This particular model provides longer steam cycles and does not use a lot of energy, saving you on power bills. Hence, for the ultimate barrel sauna experience, we advise you to try the Allwood Barrel Suana #220. The kit #220-WHC is one of the wood-fired heaters on the market today that are made for smaller patios. One notable feature of this outdoor sauna is that it was made to last for years. Its walls and barrel are made from 1-5/8 inches thick carefully grown Nordic Spruce. Thus, you can rest assured that your sauna is made of top-quality material that will last for years. With 6’8” diameters by 67” inside length, the sauna will easily and comfortably accommodate 4 adults while seated. Unlike most barrel models out there, this model has a roof with shingles which prolongs its life. It also comes with two 70 inches support cradles that you can use to elevate it from the surface. Another feature of the model is the 2 industrial grade stainless steel bands that also happen to feature a fastener mechanism. And it is one of the most affordable outdoor saunas on the market today. You will also be excited to learn that this is an easy to assemble model that comes ready for use. You don’t need to be a professional in outdoor saunas installation to put it in place. The first step of building your outdoor sauna is gathering all the material that you require to get your sauna standing. Next, choose the design of the sauna you want. Choose the perfect lighting for your sauna. Choose the perfect sauna heater or stove. Assemble the parts to get the designed sauna – here, you can easily get self-assembled parts from the market and make it easier when building your sauna. Thanks to the advancement in technology, there are different types of saunas on the market today. This makes the cost of these products to varying from one model to the other. Location and size will also determine the cost of your sauna. Traditional sauna – Traditional saunas kits cost $3000-$6000 and will come with all the parts that you will require to build them. You can easily build them by yourself, meaning that you won’t incur this cost. The rooms cost $2000-$7000 and will depend on the type of heater you choose and the size of the room. You will need to hire a professional to build a sauna room. Infrared sauna – They are quite common in many homes and go for $1000-$4000. The price will depend on the size and the features you choose. A sauna that will fit your the whole family will go for about $3000. Portable infrared sauna – These are quite popular with travelers and often cost $100-$400. They don’t offer a lot of features but they are highly portable and great for people camping outside. Outdoor saunas can be the three models we have looked above. 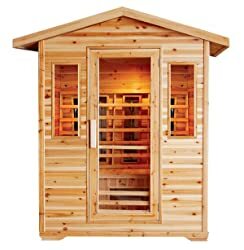 Hence you can get a great sauna from as little as $100 to over $7000. 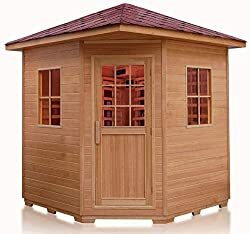 Note that building cost will also add to the cost of your sauna and you should always factor it when buying your model. The best outdoor sauna will provide you with the comfort and relaxation you desire after a long day at work. It is also a great product that will add value to your home and be a superb place to relax during the weekend. Always know the features you want in your sauna when choosing the model that will suit your daily needs.